In 1909, the USS Albatross was midway through a research expedition in the Philippines when it stumbled upon a strange new species of frogfish. 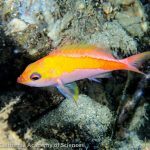 A single specimen was hauled up in a trawl from 82 meters deep along a bottom of coral sand, and, three years later, this fish would be formally described as Antennarius subteres. Fast-forward 45 years, and this species was reassigned to its own genus, Nudiantennarius, owing to its characteristic “naked” denticle-free skin and an especially long first dorsal fin spine. And that’s more or less where things have remained up until the present. Aside from the original holotype specimen, only three other individuals have been reported, and these were also from deep sandy habitats in the Philippines. 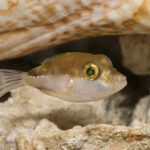 But a new study out in the journal Copeia makes a startling claim—this fish has actually been hiding in plain sight all along, with countless photographs posted on the internet. The rarity of Nudiantennarius was really nothing more than a case of mistaken identity. To confirm this, the authors reexamined that 1909 specimen, along with a handful of others that matched up with it in appearance. One came courtesy of the aquarium trade, having been collected from Bali and acquired by Golden Ina Imports. This fresh material was vital for allowing researchers to investigate the species’ genetics, providing an important look into the evolutionary origins of this enigmatic creature. Uploaded by Roser Gari Perez on 2016-09-21. 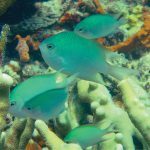 As it turns out, N. subteres is identical to a fish that divers have been photographing across the Coral Triangle for years. 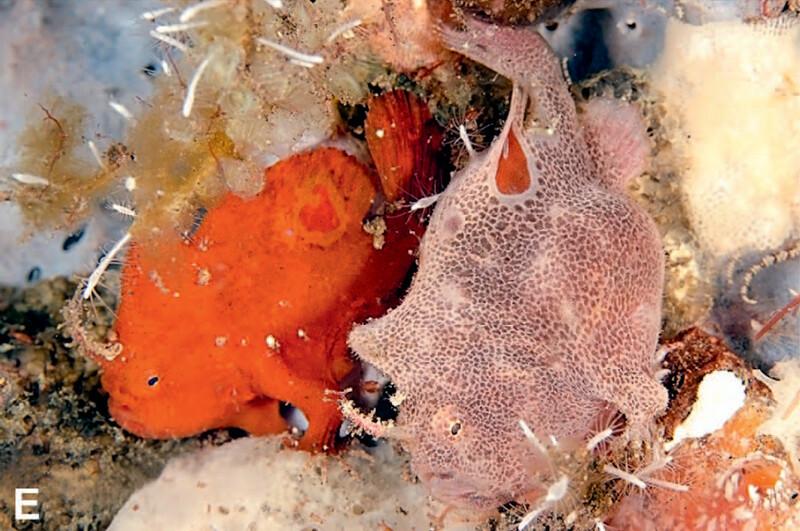 It has been referred to variously as the Ocellated Frogfish or the Lembeh Frogfish, after the famed Lembeh Straits, where the species is particularly abundant. Some referred to this as an undescribed species, while others tried to pigeonhole it into an already existing taxon, like A. biocellatus, A. nummifer, A. dorehensis or A. rosaceus, but, as it turns out, Nudiantennarius was the correct name all along. 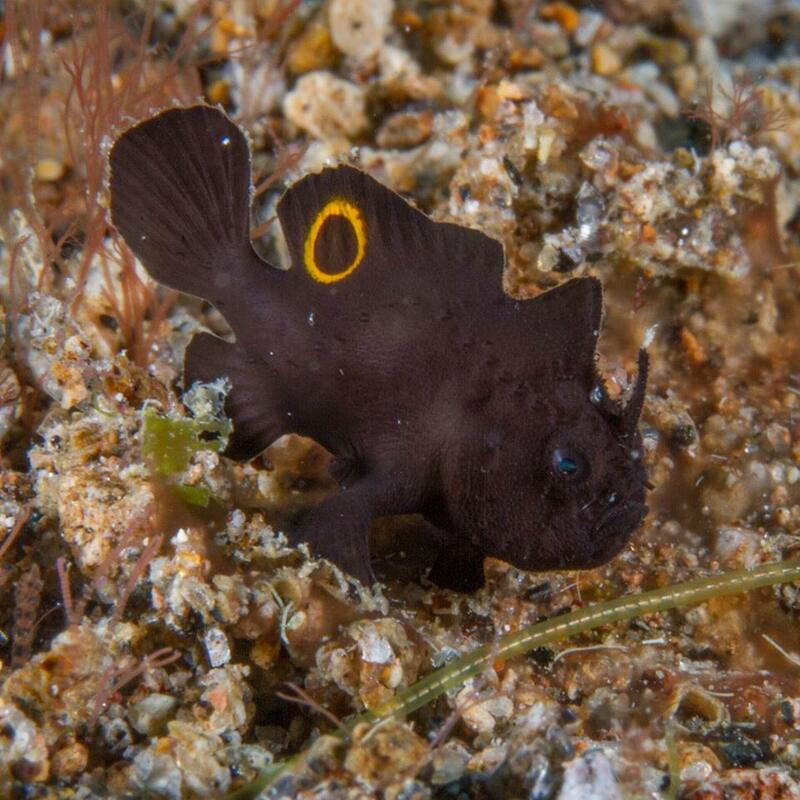 The available genetic data points towards this species being a close relative to the cosmopolitan Sargassumfish (Histrio histrio), which, like Nudiantennarius, is the only member of its genus. Both share similarities in the proportions of their dorsal fin spines, as well as having relatively smooth skin and, additionally, the arm-like lobe of the pelvic fins being somewhat detached from the rest of the body. But, while the Sargassumfish tops out at around 20cm, specimens of N. subteres range from 30-64mm. This is apparently indicative of this species’ mature size, as mated pairs have been photographed. Coloration can vary dramatically, though darker shades seem most common, followed by reds, yellows and even white. The dramatic dorsal ocellus is likewise variable, and additional ocelli can sometimes be found, while some individuals might not have any at all. Really, the best way to ID this one is to note the small size, the smooth skin and the fairly lengthy first dorsal fin spine. To date, records exist from a variety of popular dive resorts in the Philippines and Indonesia, always from open, sandy habitats (“much dives”). And, while this fish was initially known only from deeper areas, most records are now coming from fairly shallow depths (3-18 meters). 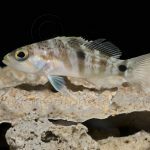 Given its broad occurrence in this region, aquarium specimens are likely to trickle in semi-regularly, even if this isn’t a species that’s likely to be directly targeted by collectors. 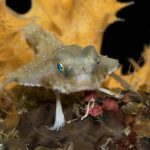 So keep an eye out the next time you spot a strange little frogfish, as it could very well be the elusive Nudiantennarius.